History: (Marvel Universe Millennial Visions 2001 - "New Warriors: The Godsend" (fb) - BTS) - Robbie Baldwin missed the camaraderie of the old New Warriors team and longed to re-form the team. He tried to re-form the team for the fifth time and all of his original comrades turned him down, causing him to lose hope that he would ever fight alongside his teammates again. (Marvel Universe Millennial Visions 2001 - "New Warriors: The Godsend" (fb) - BTS) - Active once again as Speedball, Robbie met the telekinetic/emotion manipulating mutant known as Muse, who used her powers to coerce Nova and Namorita into joining up once again with Robbie. The "new" New Warriors soon became backed by the mysterious Mister Nimbus, who constantly sent Speedball on errands against other superheroes whenever Speedball started questioning about his or Muse's backgrounds. With Muse constantly manipulating the team for Mister Nimbus, Speedball and the others went into battle for Nimbus against heroes like Daredevil, She-Hulk, and Black Panther. (Marvel Universe Millennial Visions 2001 - "New Warriors: The Godsend") - After teaching Daredevil, She-Hulk, and Black Panther lessons from Mister Nimbus, the New Warriors prepared to take care of Prince Namor. Comments: Created by Lee Ferguson. Mister Nimbus was never given any sort of visual or even really a background, aside from that he was the team's mysterious benefactor and that he appeared to be some sort of super-villain who manipulated the team. I'd add a subprofile of him, but as I said, he was never seen. Muse was a telekinetic mutant who also had the ability to manipulate the thoughts and emotions of others. She appeared to work for Mister Nimbus and aided him in manipulating the New Warriors to his own ends. Whenever any of the heroes questioned what they were doing, Muse was conveniently there to alter their thoughts off the subject. 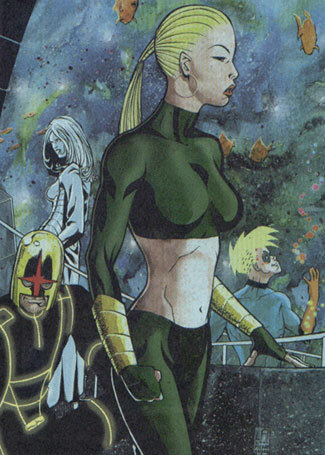 --Marvel Universe Millennial Visions 2001 - "New Warriors: The Godsend"
Namorita appeared to be the same as her Earth-616 counterpart up until Speedball had Muse coerce her into joining the latest incarnation of the New Warriors. She served the team well, never knowing that she was being mentally manipulated into doing Mister Nimbus's dirty work. 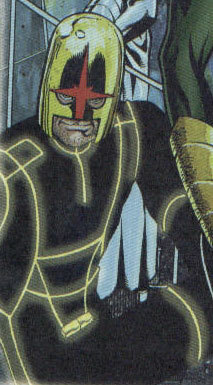 Nova appeared to be mostly the same as his Earth-616 counterpart up until Speedball and Muse coerced him into joining the fifth version of the New Warriors. He served the team blindly, never knowing he was being manipulated by Nimbus and Muse. 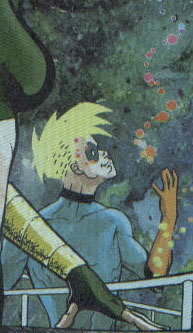 Robbie Baldwin was basically the same as his Earth-616 counterpart, constantly enjoying fighting alongside his friends in the New Warriors. After the team broke up for the fourth time, Robbie desperately missed his friends and longed the re-form the team once again. When all of his old friends turned him down, Speedball met with the mutant Muse, who helped convince Nova and Namorita to return to the Warriors. After a while of fighting with his teammates once again, Speedball began to think that there was more to Muse and the team's benefactor, Mister Nimbus, than he had originally thought. Unfortunately, every time the thought crossed his minds, he was conveniently distracted by Muse or asked to run an errand for Nimbus. Despite the team not really being what Speedball originally had in mind, he was content to be with his friends once again.